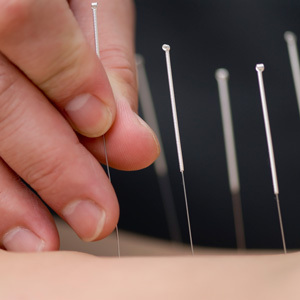 Often, people think that dry needling is the same as acupuncture. Dry needling is based on Western medicine and the knowledge of neurophysiology and anatomy. Conversely, acupuncture is based on the body’s energy flow, or Qi, and is based on Traditional Chinese medicine. Dry needling is provided at Floreat Chiropractic. It is applied to trigger points, which are the tender knots located in muscles. Trigger points can have several causes including postural strain, emotional stress, fatigue, trauma, altered breathing patterns, infection, sleep deprivation and mineral deficiencies. Dry needling eradicates symptoms quickly and effectively. When a trigger point forms, it can persist for years or even decades with no release. In turn, it can lead to recurring neck, low back or hip pain and altered joint motion. By using dry needling, the muscle can reset itself, allowing for a full range of movement and strength to be restored. A higher concentration of pain-causing chemicals is found in tissues with trigger points. When a needle enters the trigger point, the chemical levels can normalise, which releases the muscle from contracting and reduces pain. Any form of treatment may have risks, and dry needling is no exception. You may feel drowsy or tired. We’ll discuss that with you before proceeding to make sure that you feel comfortable starting with treatment. Contact Floreat Chiropractic today to book your first dry needling session!